PLEKTIX: Can we find meaning in evolution? I'm a mathematician who studies evolution. I'm also a person who thinks about how people can find meaning and purpose in their lives. And so, combining these, I've spent a fair bit of time thinking about what, if anything, evolution can tell us about the meaning and purpose of human life. I strongly suspect that evolutionary theory makes people so uncomfortable, not because it disagrees with Genesis (lots of things contradict Genesis), but because it presents a vision of a natural world whose “values” are fundamentally opposed to those of our religious cultures. By "values" (in quotes because evolution is an amoral process), Connor is referring to the often violent struggle to survive and reproduce one's genes, which includes such behavior as infanticide in some mammals and birds. While I agree with Connor's basic argument, I think it's not primarily the violence and struggle that offends some religious sensibilities (the Old Testament and many other religious texts are full of violence) but rather the inherent randomness and lack of ultimate purpose in the process. Even though scientists generally don't intend it as such, evolution fills the role of a creation story. Like other creation stories, it explains where we came from and how we got here. 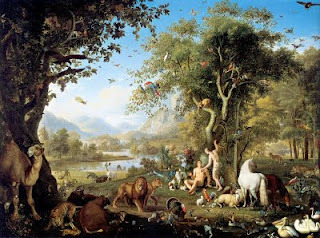 But unlike other creation stories, it gives us few clues as to where we're going or what we're supposed to do. In fact, it tells us that we're the product of random events. If this randomness had gone differently, we might not be here at all. I think the randomness and lack of purpose implied by this story is why many people—including some who believe it as a scientific hypothesis—find the idea of evolution disturbing. Where did all this come from?? What does it mean?? 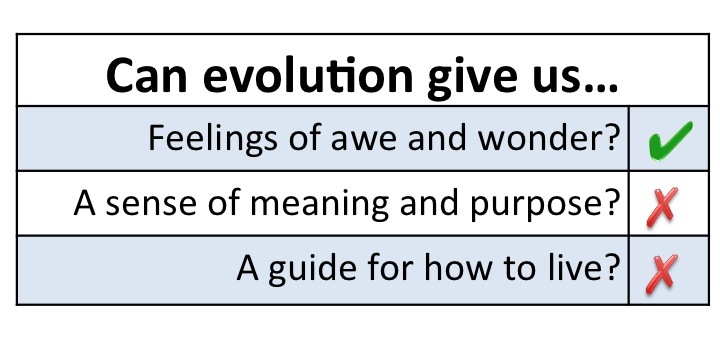 Interestingly, several thinkers have tried to turn this equation around, claiming that evolution can, in fact, satisfy our deepest psychological/spiritual needs. One of these is Stuart Kauffman, one of the biggest names in complex systems. Kauffman's latest book, Reinventing the Sacred, argues that evolution is such a creative and fundamentally unpredictable process that it can provide us with all the divine-like inspiration we need. Unfortunately, Kauffman's idea doesn't quite get there for me. It's true that the variety of life is awe-inspiring, with more and more surprises the closer one looks. However, I think that just being awestruck by the beauty and creativity of nature is insufficient: it doesn't satisfy the questions of why we're here or what we should try to do with our lives. Another approach is to focus on the potential of evolution to produce cooperation, creativity, and complexity. These aspects of evolution are highlighted in Supercooperators, the new book by my boss and mentor Martin Nowak. I think one of the reasons for the past few decades' surge of research into this side of evolution (the "snuggle for existence") is that it changes the story evolution tells about us, allowing us to understand how love, empathy, and compassion are also products of our evolutionary history. But I don't find this to be of great philosophical comfort either. First, for every example of the evolution of cooperation, there's a complementary example of evolved selfishness and violence. Second, knowing that my feelings of love and empathy exist because they were successful traits in my ancestors doesn't make me feel better about them. In fact, it makes me feel worse. I want to think of these as fundamental to who I am, not some ploy to reproduce my genes. Every time I try to think about all my love and altruism as being a product of evolution, I become sad and want to stop thinking about it. Perhaps I'm just not thinking about it right, but I imagine others may have this difficulty too. In short, my answer is that no, I don't think evolution can provide us with satisfying answers to many of our deepest questions. Some atheists/materialists argue that the conversation should end here: There is no larger meaning or purpose to life, and any quest for such is a waste of time. But these questions are a real part of who I am, as real as love or anything else I feel. Doubtless, such searchings are products of evolution themselves. Yet to rationalize them away would be to deny a fundamental part of myself. Besides, if life truly has no purpose, then what would my time be better spent doing? Reproducing my genes? Why should I care about that either, if that's also just another artifact of evolution? My approach is to grapple with these questions head on, knowing that there are no easy answers. Evolution—the most credible scientific theory as to how we got here—doesn't tell us where we're going or what to strive for. And yet it has implanted us with a deep need to plumb these questions. One could, I suppose, see this as a cruel joke that our evolutionary history has played on us. But I think these questions are as real and important as anything else we experience in life, and there is fulfillment and self-knowledge to be found in exploring them, even if we strongly suspect that satisfying answers will never be found. 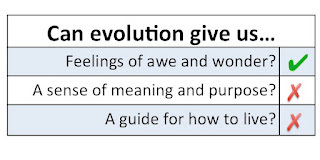 Evolution can give us meaning, purpose and even a guide to live. But we don't all want to hear its message. The lesson of evolution, and virtually all modern biology, is that humans are similar to all other forms of life: their purpose is to perpetuate their species. That's what living organisms do. In this "ethic" humans have been remarkably successful. We can give ourselves a well-deserved pat on the back, despite some occasional lapses. On the other hand, we have the smarts to look down the road a bit and realize that biological success is more than having a boatload of kids; no species can get away with spoiling the nest, and the human nest has become the entire globe. So here we have purpose (save the human race) and ethics (by acting to ensure a sustainable ecosystem). OK, maybe this purpose is not as immediately satisfying as if we were hiding from Cylons, but from the evolutionary point of view we are waging just as critical a battle with each generation, so we should not grow complacent. A nuclear war would set us back quite a bit as a species. The ethics in this world view are less obvious when one try's to relate this viewpoint to a daily guide for living. But human biology has already evolved some key aspects of ethics (likely the reason that you asked the question in this blog in the first place). Nevertheless, " there is grandeur in this view of life" to paraphrase. In recognizing your own lack of faith in any religious dogma and fully realizing the truth in science particularly evolutionary biology [I feel] you need to put aside all "spiritual" ideologies as well. This may be hard especially because I realize most people feel a strong irrational need for spirituality. The first step is realizing this is irrational and spirituality is nonsense. Evolution cannot give us "spiritual" purpose because evolution is not a spiritual idea, it is factual, tangible and based in reality. Like the first response, I agree it can give us a very fulfilling purpose but this cannot be called in any way "spiritual". Personally, awe and wonder of the universe and my evolved morality is enough for me but maybe I'm missing something in my psyche. NOTE: I edited this post after first publishing it. I wanted to de-emphasize the stuff on "selling" evolution to those who don't believe it---this topic is already debated to death on the internet. Instead, I wanted to focus it more on my own philosophical views and questions. @Anon 1--It's true that evolution gives us a notion of success, in terms of perpetuating the species. But this is still unsatisfying to me. From a philosophical standpoint, why should I care about whether the human race survives for 100 years or 100,000 years? After all, even if humans destroy themselves, life on earth will continue and probably produce other intelligent life forms. And then later the sun will explode, eliminating it all. Sure, I have evolved instincts to perpetuate my genes, but is the purpose of life just to follow these instincts? @Anon 2-I don't think you can talk about rational and irrational without reference to some goal or objective. If there is no goal, than all actions are equally rational or irrational. Personally, I think the need for philosophical or spiritual quest is a real part of our natures and should be treated as such. It's similar to love in this way. Of course one can argue that love is an "irrational" by-product of our need to reproduce, but that doesn't make it any less real for those who experience it. I argue we should deal with these needs and feelings as real entities, even if they exist only in our psyches and are products of evolution. Why are we worried about purpose and meaning? Why are we searching for an objective response to the question of "What should we do with our lives?" That should be the real focus of inquiry from an evolutionary perspective. The way I see it, if those questions had answers then we would have to declare our purpose was to be slaves. Why are we worried about purpose and meaning? Why are we searching for an objective response to the question of "What should we do with our lives?" Hang on, I never said I was looking for an objective answer to these questions. I think a satisfying subjective answer would be sufficient. That should be the real focus of inquiry from an evolutionary perspective. The question of why we have the need to ask philosophical questions is a deep and interesting one. But that's an entirely separate line of inquiry from actually investigating these questions themselves. The way I see it, if those questions had answers then we would have to declare our purpose was to be slaves. I'm not sure how having meaning and purpose in one's life makes one a slave. Or are you defining any kind of goal-directed behavior as slavery? What, then, would not be slavery? meaning and purpose were once thought to intersect with evolution in the form of eugenics. and whether we like it or not, that's still how it's seen in most older people's minds. lately the younger generation seems to be turning toward transhumanism, but that's only one possible interpretation. Evolution is tricky when it comes to human society and individual fate. We seem to have evolved as beings with choice, or at least the illusion of choice. Does that mean we have evolved to choose our own evolutionary destiny? Could there be a choice for us between competition and cooperation as a way of survival, for instance? Of course we must ask if individual worth and freedom (not to mention meaning) are worth considering given the overwhelmingly determined nature of the physical world we form part of. Without the belief in a god that assesses individual worth and invests the universe with moral purpose, where is the standard to judge our invidual inclinations and actions? To these questions I would answer that our freedom of choice is neither illusory nor trivial, though this point will be endlessly debated. If I am right, then we can create meaning in excercising that choice. The vast power of physical determinacy cannot be denied, and is a sufficient explanation for most phenomena, including societal phenomena. But there is also meaning in the fact that we've evolved to make choices, and those choices -- perhaps for love, kindness and fellow-feeling -- must then figure in our evolutionary outcomes. I would answer that our freedom of choice is neither illusory nor trivial, though this point will be endlessly debated. If I am right, then we can create meaning in excercising that choice. Yes, I think there is something to this. It seems clear that we create meaning through our choices, and so part of finding meaning must be interrogating the choices we make. I do think you're overemphasizing the determinism in the physical world. I think this idea is a holdover from Newtonian mechanics, which turned out to be an incomplete description of physics. The laws of physics restrict the possibilities for the future, but do not wholly determine the outcome. I think there is no inherent meaning to life other than life as an end in itself. The goal of living things to to keep living as long as possible. Religion does not directly create any purpose either. It tells you that you're here because God made you as part of some divine plan. No religion really explains what that plan is, and this would be just as unsatisfactory emotionally as no plan at all. So what if some entity has plans for you, plans you can't understand, never signed up for, didn't choose. The way religion REALLY hooks people is with the promise of eternal life. Take that away, and all you have left is that something or someone wants you to follow its rules, live a certain way, for its own inscrutable purpose. But there are no consequences for disobeying, everyone still only gets this one life and then it ends forever. There would be little meaning to this, and most people would find it quite silly to follow the rules of some book, because it doesn't LEAD to anything. You could see other people living apparently happy lives, happier than yours maybe, but following no divine plan. You would ask yourself why you obey the book when there are no consequences, when someone else can choose to not follow it, have a happier time than you on Earth, and in the end you all end back in the dirt and that's all there is to it. This would be emotionally unsatisfactory. I say this because I want to point out that the "meaning" from religion doesn't really come from a sense of obeying a divine will or being part of a divine plan or believing in some God-given purpose. All these things are possible without eternal life, but without eternal life they are emotionally meaningless. So in the end, the attraction of religion also comes down to the statement I began with - the value of life itself. Life as an end in itself, an unquestioned good, that needs nothing else to justify it. As an aside, when religion is making the big promises, it can also make little ones, adding "painless", "no boredom", "joyous" etc. as qualifiers to the "eternal life", just in case you had any doubts. So the way I see it, the only good to a human (or to any life), is life itself. This is the only thing that satisfies our emotional needs, because we know that without this one thing, nothing else is possible. All rewards, all pleasures, all good things come only to those who are alive. The dead have no benefits. Religion takes this idea and runs with it. You know that life you love so much? How'd you like 10 more years of it? 20! A hundred! Heck, while I'm making promises, how about FOREVER???!!! This is really the emotional satisfaction of religion. All else is window dressing, to make you feel you deserve the great good fortune you are about to receive. Those of us who don't buy into that promise do without religion. We are like the religious people in that our only value is life too. But since we know it won't last forever, we try to enjoy this little blink in eternity while we're alive. There is meaning and purpose there just as much as in religion. It's just for a shorter time. I really enjoyed the premise of this blog entry, analyzing the role our understanding of evolution plays on our understanding of the point of life. I've been thinking about meaning and purpose in life more frequently as of late, and this is one of the more interesting reads I have found while browsing the intertubes. It does seem to be a cruel joke that we are intellectually capable of questioning why we are here and what are we supposed to do, but not intellectually capable enough (or so it seems) to discover the answers. I too have found life to be "awe"some, but have not been satisfied regarding the purpose of life. I find a lot of things pleasurable in life, I have loving relationships, and I enjoy getting to help others in my line of work (mental health), but I am still bothered that I don't have any satisfying explanations to tell myself about why I am here, a conscious being, for a temporary amount of time, on this twirling rock in an unending universe. If I ever come up with any insights, I'll post something! So then the logic of evolution dictates that whatever I want to do, and can do I should be able to do? And the only way to say I can't do "X" is if you can stop me by doing "Y"? So then asking "why am I here?" the answer is simple: To do whatever you can, to anyone you can, for as long as you can, until someone doing whatever they can; can stops you? Dave M wrote "we try to enjoy this little blink in eternity while we're alive." So what happens when my "enjoying" my "little blink in eternity" interferes with someone else and their "little blink in eternity" If they can't stop my interference. To bad right? Taking a naturalistic approach to the feeling of "searching for meaning and purpose," helpful questions to ask could be, "What brings this feeling/drive about?" "How does this feeling work/function?" "Given that I know how that 'need' works, what do I do now?" Helping to clarify the questions and answers above is where I think evolutionary biology can give good pointers. Beyond that, evolution is a mathematical model which makes specific predictions; using it as a psychological ointment seems somewhat out of its domain of applicability.